Everything went by so quickly. I can’t believe it’s over and I am a priest. I have barely had a chance to breath, let alone sort all of it out. Living in the moment of Light and Love takes away all sense of time and place. It already feels like a dream. But, from the second I heard the drumbeat begin the prelude – “Come to the Living Stone” – I knew it was really happening. As we processed in, the faces of so many friends floated by. This long awaited moment had become a reality and God was drawing me in, welcoming me to the service of all God’s people, showering down graces beyond measure. I have always been told that the sacrament of Holy Orders carries a profound and indelible mark placed there by the Holy Spirit. But, to experience it first hand is another matter. The witness – oh the powerful witness – became palpable as I felt the hands of those present on my head. 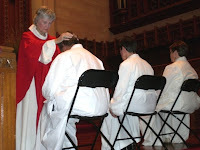 The smell of the warm oil on my hands as the bishop anointed them, the robes being placed on my body – robes that fit like a glove – brought with them a new and renewed identity. The table set with the cups and plates I so often washed and placed on the altar as a sacristan, the familiar homemade bread and wine being lifted up in prayerful readying were all actions I had seen time and time again. Then came the moment - the moment of profound humility, love and gratitude all wrapped in the words Jesus speaks to us down through the ages. Nothing, nothing can be more profound or palpable than witnessing the presence of Christ's Love in our midst as we gather around the sacred table to celebrate the holy meal. Every human being reflects God's image, radiates divinity in our midst. As womepriests we remind the church that, all are sacred images of the Holy One, all are one in Christ. 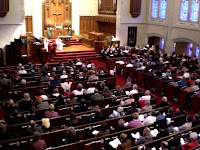 We are now living our dream of inclusiviity through a renewed priestly ministry in our beloved church. As the lovely “Panis Angelicus” was sung my sense of time and space completely left. When it was over I could hardly figure out how to stand. But, some how I did and we all danced down the aisle singing and hugging, kissing and embracing and praising in the Light of God. Bishop Dana Reynolds, Roman Catholic Womanbishop, is the first U.S. bishop for Roman Catholic Womenpriests in the United States. 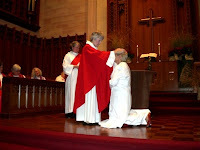 She officiated at the most recent ordinations in Chicago on Nov. 1, 2008. 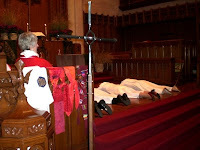 See photos in blog below of these historic ordinations. "How many times can you be excommunicated?" This article that appeared in a Catholic newspaper, communicates a positive message. 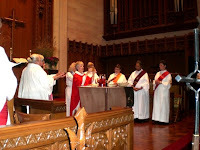 In spite of the excommunications, the people of God are affirming Roman Catholic Womenpriests as we lead the way to a renewed Roman Catholic Church in which women take their rightful place as servant leaders. Bishop Dana Reynolds is the first U.S. bishop elected by the western region of the U.S. She serves as a spiritual director and volunteer hospice chaplain. She has presided at 7 of the 8 ordinations in the United States in 2008.